Our next two Inspiring Women are Rea Gomez and Zarah Manikan, two mummy entrepreneurs who dreamt big, pursued their passions and are now happily enjoying the benefits of their hard work. They are two friends, bound by their common love for food, who wanted to create something that Manila has never seen before. Both of them are equipped with their own talents and skills and they also share a common desire for good food, particularly, some very good ice cream. They went to Italy, studied in what is popularly known as the gelato university and met the real masters of gelato making. Armed with enough knowledge and driven by their passion to bring only the real thing back home, they set out to create what is now known as the freshest and most authentic Italian gelato in Manila. 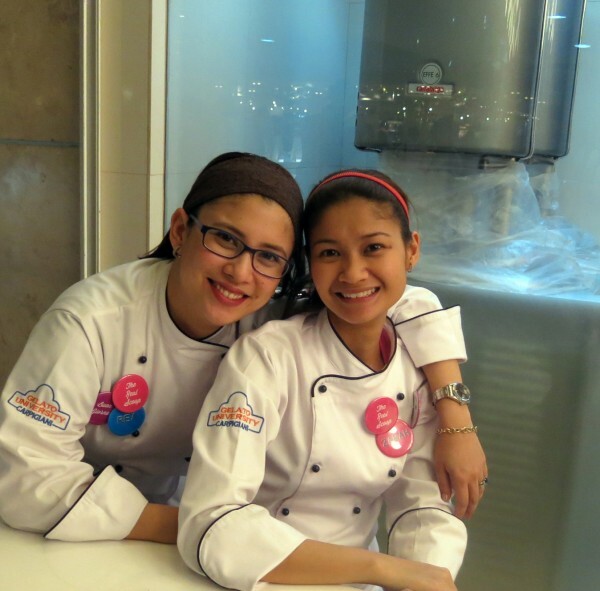 Tell us a little bit more about Rea Gomez and Zarah Manikan and how your business together started. ZARAH: Between the two of us, Rea is the creative person. She did our branding and graphics. She likes doing crafts…she did our Christmas decors in all our outlets last December! She’s a hoarder of books and kitchen gadgets too. She is the marketing and advertising expert. Meanwhile, my passion is in cooking and baking. Before BONO was born, I was a very busy home baker. I used to bake breads, pies, and cook for family and friends. REA: I’m a mother of one very precocious boy (who is my carbon copy), an avid food enthusiast, a traveller and yes, a bit of a crafter… My ambition is to become a professional hobbyist! I’ve been in the marketing industry for awhile now (not admitting my age!). I started in media, then dabbled in creatives, and eventually ended up in corporate. I still consult for several companies now and am constantly looking for things that inspire me and places where I can be of help. Zarah and I met through a common friend and our love for food plus similarities as young moms and the curiosity about the world led us to put this up together. 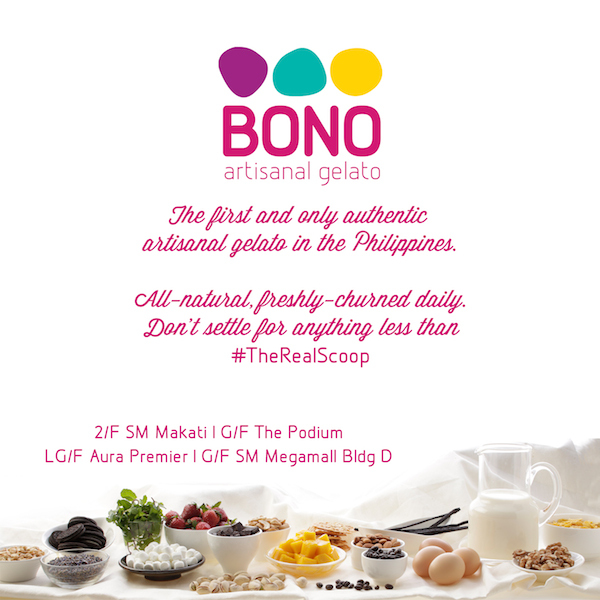 What is BONO Gelato all about? What made you start the brand? REA: BONO started as a dream. We had set out to do something Manila had never seen or experienced before. 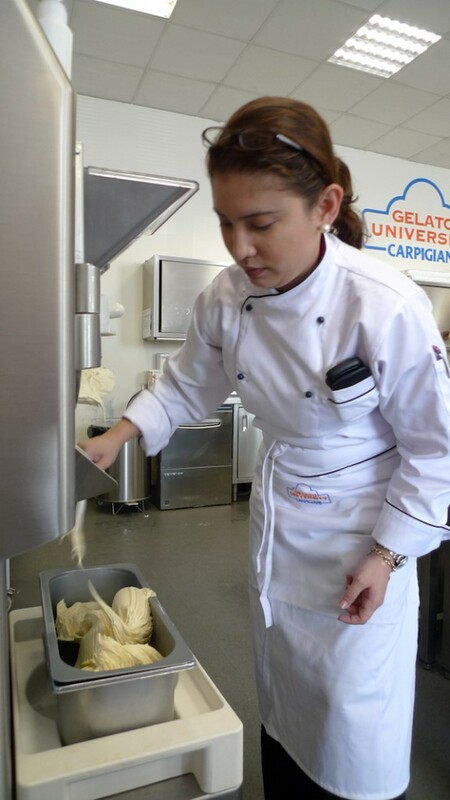 Our desire to create the “ultimate” ice cream led us to Italy, where we learned the art & craft of gelato making. There is a romance to it and a long history behind it… and of course, the passion of the Italians is just infectious! We started talking and putting ideas together way back in 2011, and at that time, artisanal ice cream or gelato was only just beginning in Manila. We had eventually come up with an initial concept, and started throwing some names around. Nothing would stick, though. When we went to Bologna, to study at the Carpigiani University, we went to various gelaterias and met the Maestro Gelatieres there. One of them was Giacomo Schiavon, of La Sorbetteria, who is considered one of the biggest stars in the gelato scene. I had jokingly called him a “rockstar” because everyone wanted a photo with him. “You’re such a rockstar, like Bono.” Kaboom!! We found our name! 😀 We asked some friends what “Bono” meant to them and we were told that they colloquially use that word to mean “Ok!” or “Good!”… so that name was meant to be, I suppose. 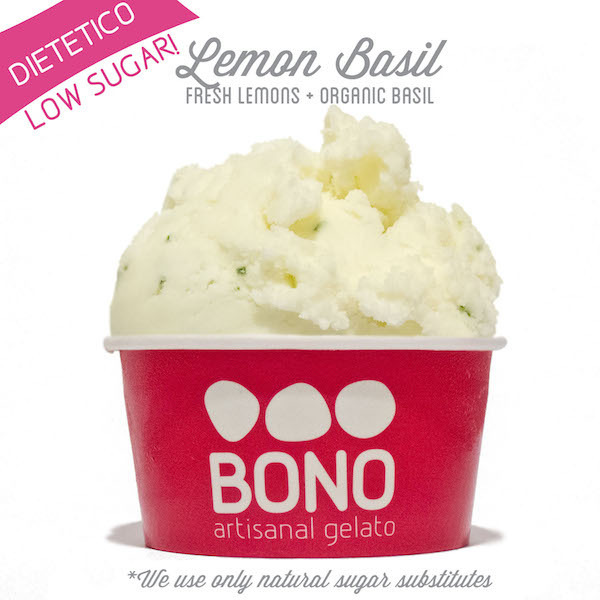 How did you grow BONO GELATO to what it is today? ZARAH: We started with 10 flavors with our first branch in SM Makati. And now we have more than 50 flavors based on seasons, special occasions, collaborative flavors with other brands, etc. All these flavors are proudly made by us. REA: We opened our first branch on 12-12-12 in SM Makati. We started with just a few flavors, and have been creating more and more since then. We try to come up with a new flavor every 2 weeks or so, to keep things exciting and to give customers even more reason to keep coming back. We now have 4 branches: SM Makati, Podium, Mega Fashion Hall, and SM Aura. We are hoping to open a few more this year and are constantly looking for spaces. Aside from that, we are also looking at growing our product line this year. Exciting times ahead! 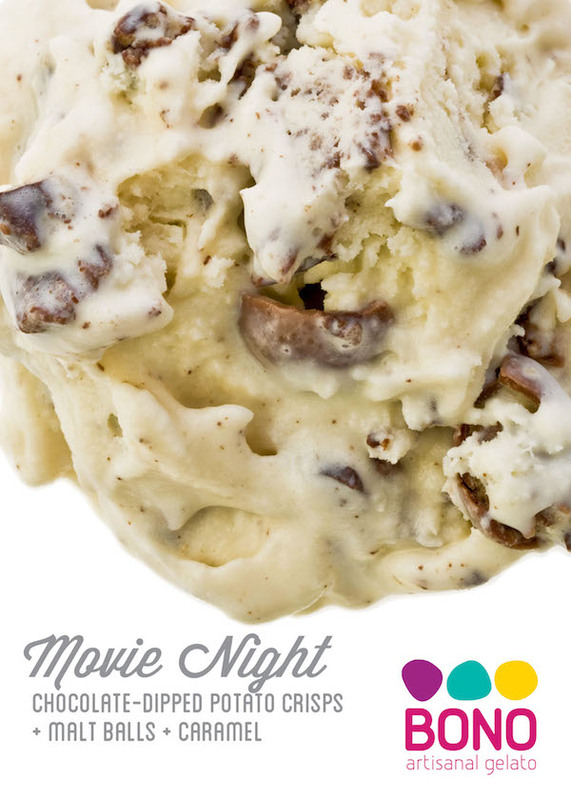 Two of our most popular flavors are : Cioccolato made of 70 % pure and dark chocolate and Movie Night made of chocolate dipped potato crisps, malt balls and caramel. 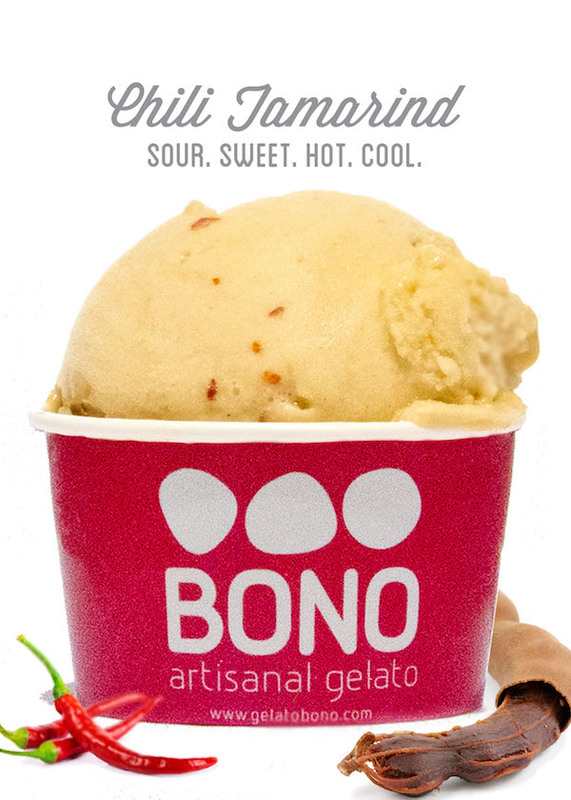 What is the creative process like behind each flavor that comes out from BONO Gelato? ZARAH: We get inspiration from many things : books, internet, occasions, blogs, people that we meet and collaborate with. 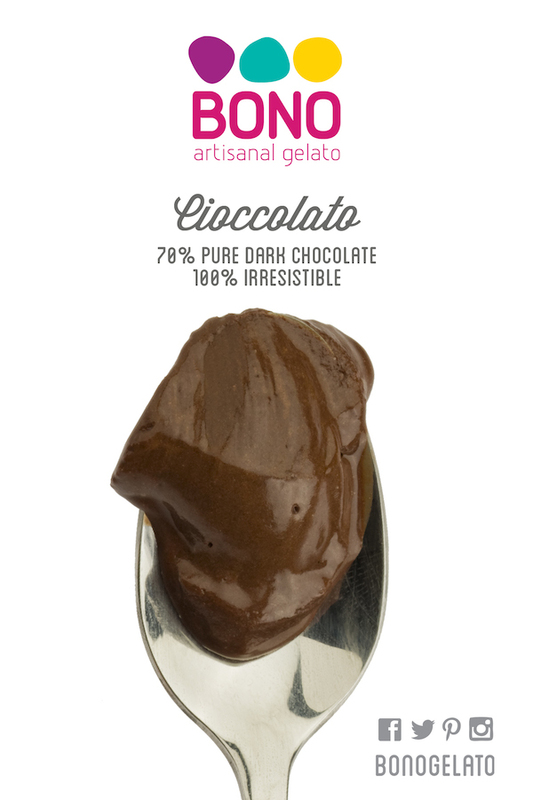 When we pick a flavor that we like and decide to pursue it, my job is to turn that flavor to its gelato equivalent. This in fact is a highly technical, mathematical and scientific process, because it involves balancing of properties of the ingredients. This includes testing its reaction to temperature, which may affect its texture, taste and consistency. 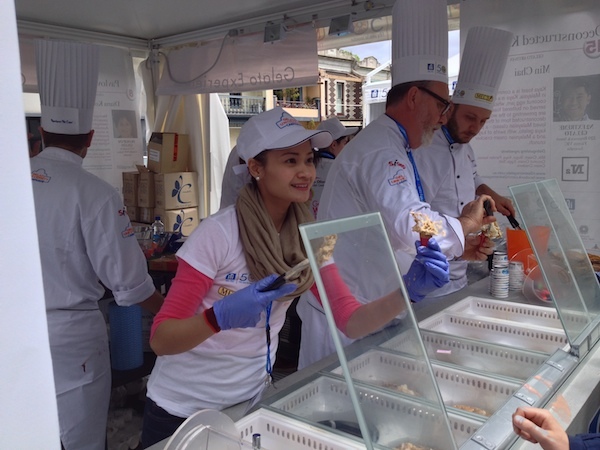 We also go out a lot to research and volunteer, like what I did for the Gelato World Tour. This is a good way to learn from other gelato masters and chefs, as well as to see what else is out there. REA: Our creative process isn’t cut and dried, it’s pretty fluid. We want to be open to current trends and seasonality, etc. Once we decide on a flavor or series of flavors to pursue, Zarah gets cracking. She handles the more “scientific” part of the business. She formulates the recipes and trains the staff as well. We usually meet as a team, and Zarah lets us taste the various samples she has come up with. We all give our suggestions on how to improve, what ingredient can be added or removed, if it needs more crunch, sweetened less, and so on. We also sometimes ask friends to help out, especially when we’re stumped and can’t decide on a flavor. There are quite a number of gelato places out there in the market now, what sets BONO GELATO apart? REA: We believe that what really sets us apart is the quality of our gelato. We are the first and only gelato brand in the Philippines making an all-natural product : no preservatives, no emulsifiers, nothing out of a tube, can, or plastic bag. We use fresh ingredients only, and save for 1 flavor (Red Velvet: because the alternative would have been natural coloring from bugs), we use no food colors or anything chemical. We also make our gelato fresh DAILY. Yes, daily. For some flavors, even several times a day, because we churn them in small batches. Just as if you were making it at home. You can be assured that what you are enjoying was made just a few hours prior and not sitting in a freezer for days, weeks or even months. Our equipment is also unique, as we are the first in the country, and only the third in Asia to be using this prestigious Italian system. And because we make all our flavors on our own, using real, fresh ingredients, we are able to create our own concoctions, in response to market demands and trends. That makes a big difference because we are able to give customers what they ask for. We are not bound or limited to the flavors of an international head office. We are able to make localized, seasonal flavors. We at BONO really enjoy what we’re doing. And we’re hoping it comes through with our product and overall experience. Being new in the market, what are the usual challenges you face in the business and how do you handle them? As with starting any business, the first few months/years are the most challenging. We’re still learning a lot about the business and the market and trying to adjust as best we can as we move forward. What makes this business challenging is that this is so close to our hearts. This is actually more like a passion project than a business. When faced with tough decisions to be made, it is sometimes difficult for us to decide whether to lean toward a business inclination or just throw caution to the wind. We’re grateful and overwhelmed by the response of the market during our first year. Although this has been very challenging – since we introduced a totally new idea/concept into the market – we are happy to have kept our heads above water. We are inspired to keep going and to continue pushing the envelope. What are your future plans for BONO? You can expect many more new, innovative, creative products to come from BONO. There will be both vertical and horizontal growth. We’re wanting to build on the trust we’ve earned, as our customers now know of our commitment to quality. Any new flavors in the pipeline? We have 2 very exciting flavors coming soon : Chili Tamarind and Lemon Basil. 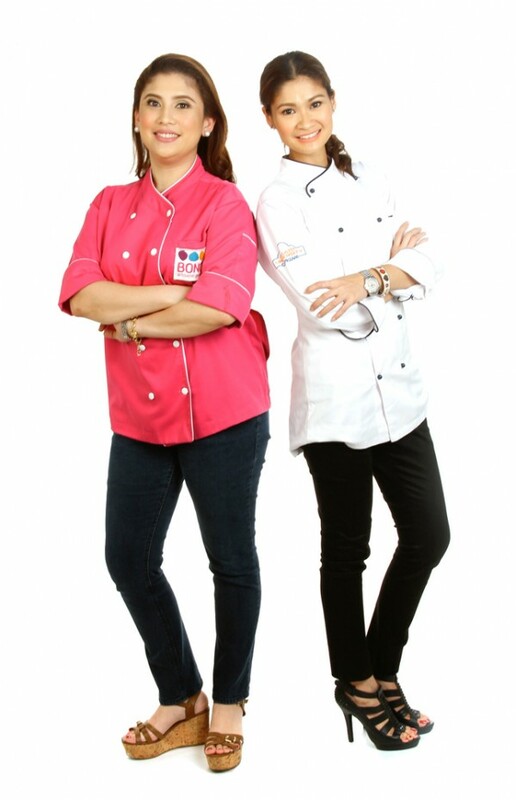 Because you are our two Inspiring Women, can you tell us, what inspires Rea and Zarah? Where do you get your inspiration from? ZARAH: I get inspired by people and books. I get inspired by my own experiences and travels. My kids, my family are my sources of inspiration. REA: My biggest inspiration is my son, Niccolo. That sounds predictable and cheesy, but really, he is. I also draw a lot of inspiration from reading, from friends and people I meet. I try to keep myself in check pretty often and try to be introspective. I am constantly striving to keep in motion, moving forward and learning from the past. 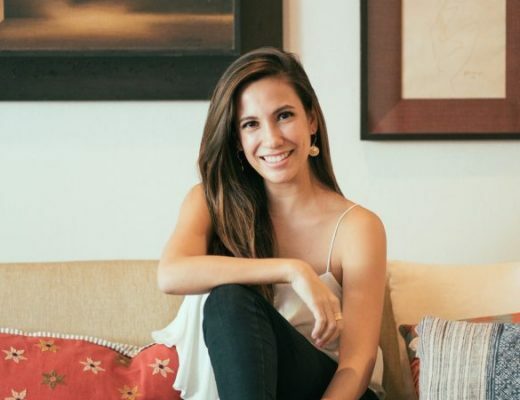 There seems to be an influx of women becoming entrepreneurs nowadays, can you share with us some tips on how to run your own business effectively? ZARAH: Be hands-on at all times. And yes, lots of TLC. REA: You definitely have to be hands-on, but also know how just tightly you can hold on. My motto is simple: I do my best in everything… but I also know when to let go and let be. How do you balance your time between your business and your family life, given a very busy schedule? ZARAH: You have to make time for both. When it’s time for work, it’s all work. When at home, it’s all about the family. Once a month I also try to take a day’s holiday with no commitments. And I throw in some meditation as well. REA: I have to admit it is tough, and I find myself still slipping up every so often. I suppose the key really is discipline. Learning to say NO to some projects and people, so that you have enough time for other things. I try to keep a very open communication with my son and even try to get him involved in the business when possible. REA: I’m fairly “spoiled” in the sense that I like good food, travel, and indulging in some luxuries every so often. I’ve always been very independent and actually enjoy business and working. So when someone else “spoils” me, it truly is a treat. I treasure experiences more than things and I look forward to more adventures ahead. Dear Rea and Zarah, you are true amabbasadors of artisanal gelato. We can’t wait to have you in the Asia stage! Thank you for featuring the ladies behind Bono Gelato! I’m a big, big fan of their gelato, and a trip to SM Makati is never complete without having a scoop at Bono Gelato. I’m quite addicted to their Taho flavor right now. It’s just ‘ice cream’ but gad, I find it better tasting than the real taho! Sago na lang ang kulang hehe! Same reason why I love BONO Gelato. They make their gelato fresh daily so you are assured that quality and taste are never compromised. Thanks for dropping by!